Money, money, money. Must be funny, right? Not always. Sometimes money is just confusing. Like trying to calculate the exchange rate in a heated bargain, and figure out what that silk scarf is actually worth. Then you hand over your cash, only to be told you’ve mixed up the bank notes. And when you walk away, you pray that the silk scarf better be real, if not it’ll be the world’s most expensive polyester. China is not making it easy for you, with its cash economy. If you are not prepared you’ll spend plenty of time trying to figure it out, and in worst case making yourself a target for dishonest sellers. My goal is that you will not be one of them! Doing a little research up front can save you lots of embarrassment and hassle, so let’s start with a basic introduction to Chinese money, known as Renminbi. Or Yuan. Sometimes kuai. And what is CNY? A pet child has many names! If you are already confused, it’s a good thing we started the training now. The name of the currency is RMB, short for Renminbi, which means the People’s Currency. The money is called yuan, and the Chinese character is 元. The currency code is CNY (short for Chinese Yuan). The sign for the currency looks like this ¥. So you might see prices written as 150.00元 or ¥150,00 or CNY150 or 150,- Anyway, it’s always Chinese money they’re asking for. China is still very much a cash nation, and you’ll find you need bank notes to pay for taxis, shopping in smaller stores food stalls and restaurants. Yuan comes in notes of 100, 50, 20, 10, 5 and 1. You also have 1 yuan coins, which for some reason are more used in Shanghai than other cities. ¥100 is around US $16. Then you have the jiao coins. One jiao is a tenth of a yuan, and come in 5, 2 and 1 coins. 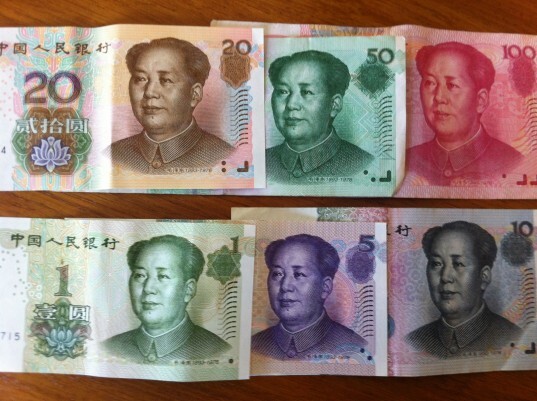 You might also get the old jiao notes, they are smaller, but have the same colors as their big brother yuan notes. Don’t worry, if you try to pay 5 yuan with a 5 jiao note, the seller will let you know. Not always the other way around, though. If you get a lot of change, it can be wise to check the amount; some sellers take advantage of foreigners not knowing the value of the different bank notes. If you exchange cash or shop in supermarkets, you might get fen coins. They are made of recycled aluminum, weigh nothing and don’t feel like money at all. One fen is 1/100 of a yuan (or 1/10 of a jiao if you like), and very seldom in use these days. I like the old 1 fen notes, they were the size of a big stamp, made of yellow paper and had a picture of a cool, old-fashioned truck. The days where you could go shopping with fen notes or coins are long gone, and even the street beggars will be offended if you put fen coins in their cups. Are you keeping up so far? The money might officially be called yuan and jiao, but orally they are known as kuai and mao. ¥3.40 will therefore be pronounced 3 kuai 4 mao. Sometimes they won’t even say the price, just show you their fingers. 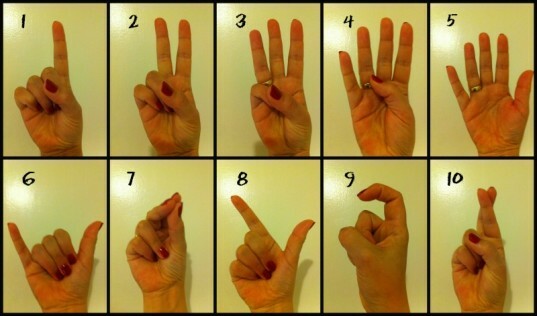 They are not being rude, only using the Chinese number gestures. You can study the pictures, after a little training you’ll be as good as the locals. Now, how much you end up paying for things in China, really comes down to how well you bargain! If you want to master the art of bargaining in China, you can start your lessons here! Everything you need to know about Chinese money. Oh my goodness – I don’t think I would ever have thought to research this until now! I’ll definitely come back to your guide before heading to China. Thanks for the post.